Huawei's Honor division has now launched the new Honor 10 Lite smartphone that comes with impressive features with a new design along with a water-drop notch. It has a dual rear camera with AI support and comes with a 19:5:9 aspect ratio display with over 90% screen-to-body ratio. It has a glass back with gradient finish and has a rear-mounted fingerprint sensor. It is priced at 1399 yuan (around $201) for the 4GB RAM + 64GB inbuilt storage variant, 1699 yuan (around $244) for the 6GB RAM + 64GB inbuilt storage option and 1899 yuan (around $273) for the top-end 6GB RAM + 128GB inbuilt storage variant. The device is currently available for pre-order and will go on sale in China starting from November 22nd. It will be available with Midnight Black, White, Gradient Blue, and Gradient Red color options. 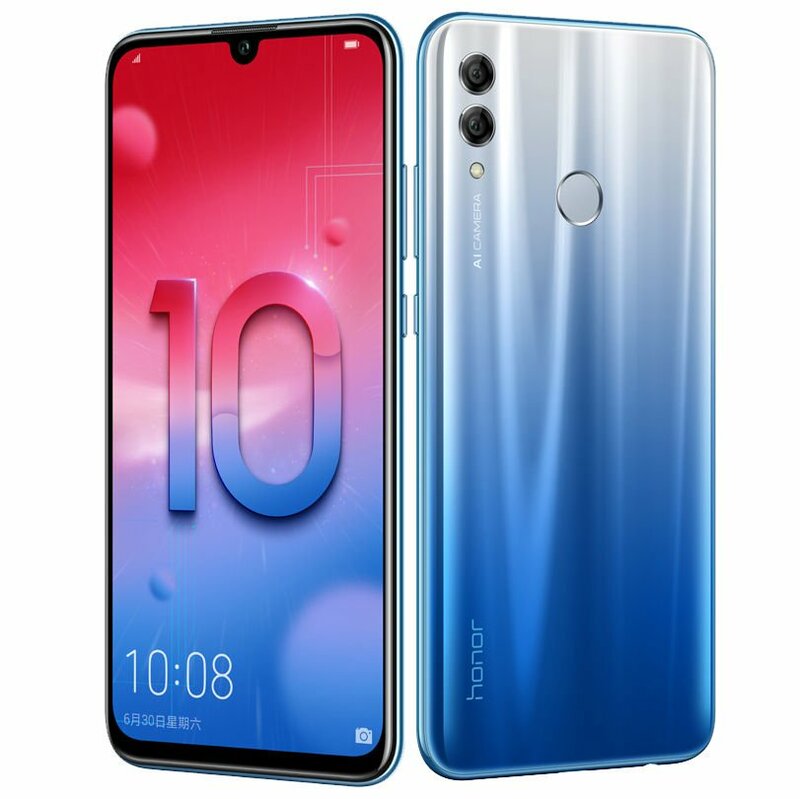 The Honor 10 Lite features a 6.21-inch Full HD+ 19:5:9 2.5D curved glass display with 2340 x 1080 pixels resolution and is powered by an octa-core Kirin 710 12nm (4 x 2.2GHz Cortex-A73 +4 x 1.7GHz Cortex-A53) with ARM Mali-G51 MP4 GPU. It comes with multiple variants with 4GB RAM + 64GB storage, 6GB RAM + 64GB / 128GB storage with expandable storage up to 256GB with the help of a microSD card slot. It runs on the Android 9.0 (Pie) with EMUI 9.0 out of the box and comes with Hybrid Dual SIMs slot (nano + nano / microSD). It features a dual rear camera with a 13-megapixel camera with f/1.8 aperture, LED flash along with a secondary 2-megapixel camera. It has a 24-megapixel front-facing camera with f/2.0 aperture. It comes with a 3400mAh battery and comes with connectivity options such as Dual 4G VoLTE, Wi-Fi 802.11 ac (2.4GHz + 5GHz), Bluetooth 4.2 LE, GPS + GLONASS. It has a fingerprint scanner on the rear side. It measures 154.8×73.64×7.95mm and weights 162 grams. To recall, the Honor 10 was announced with a 5.84-inch Full HD+ LCD 2.5D curved glass display with 96% NTSC Color gamut and 2240 x 1080 pixels resolution and it is powered by an octa-core Huawei Kirin 970 (4 x 2.4 GHz A73+ 4 x 1.8 GHz A53) 10nm processor with Mali-G72 MP12 GPU. It comes with 6GB of RAM along with 64GB / 128GB internal storage options. It runs on the Android 8.1 (Oreo) with EMUI 8.1 out of the box and supports Dual SIMs. It features a dual rear camera with a 16-megapixel (RGB) primary camera with LED flash along with a secondary 24-megapixel (Monochrome) rear camera with f/1.8 aperture, depth focus, PDAF, and CAF. It has a 24-megapixel front-facing selfie camera with f/2.0 aperture. It comes with a 3400mAh battery and connectivity options available are Dual 4G VoLTE support, WiFi 802.11ac (2.4GHz/5GHz), Bluetooth 4.2 LE, GPS, NFC, USB Type-C, 3.5mm audio jack and also comes with AK4376A Hi-Fi chip for HQ audio quality. It has a fingerprint sensor on the rear side and also comes with an infrared sensor. It measures 149.6×71.2×7.7mm and weight 153 grams.